A lot of people want more work opportunity but don’t know how to go about it. 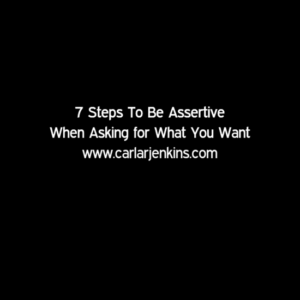 Here are my 7 steps to be assertive when asking what you want. In my case, I wrote a justification as to why I should be granted this. I did market research, job outlook with salary info. Focus on ROI (return on investment). In your proposal/justification, answer this question: how will they recoup their ROI when they give you the money? It’s rare that things go according to plan and you get automatically approved the first time. They may come with follow-up questions or an outright denial. Having a rebuttal prepared keeps you ready. A rebuttal also removes the anger and emotion out of the situation. Oftentimes when you open the email and get a negative response, you shoot off a missile which will destroy your chances and professional credibility in the process. Having a rebuttal lets you have a levelheaded response to rejection. You can also use your rebuttal as a template adding in any more pertinent information in case you do receive a denial. It is a process especially when it comes to doling out money and resources. People will inspect, review putting your request under a microscope. I stress the word periodically. Don’t hound people emailing them every day! In my case, I emailed my training officer once every 2 weeks. That’s more than enough time (and space) to see any progress that has been made on your application. Shooting them a weekly email would suffice too. My total second training request period from beginning to end was 5 months. During my wait, I found subject-related YouTube videos and channels, purchased my exam prep book and enrolled in an online exam prep course. The closer I have gotten towards approval, the more serious I became. You need this because sometimes you are so busy awaiting a response, that you’ve forgotten why you’ve submitted the request in the first place. I know it happens which is why I’ve added this step. Answer these two questions: What are you going to do when you receive the money? How are you going to act when you receive the money? These two questions are important. In my case, when I receive the money, I will pass my certification exam the first time. I will be appreciative that my training request is approved and view this as a stepping stone towards bigger and better opportunities to help the organization and become a better professional. Bonus tip: Remember, whenever you ask for extra, the goal is not to fail. It has taken a lot of manpower, time and signatures to get an extra request fulfilled. Don’t squander this opportunity. There is life after completing your training or receiving your certification. Having an after-action plan puts things into perspective. Answer this question: How will you incorporate your new credential/training into your work life? How do you see your work life being different upon completing your training/credential process? In my case, after receiving my first certification, I started blogging and doing a webinar. These two activities built my authority. Bonus tip: Treat your new training like a muscle. If you don’t want it to atrophy, you have to use it every day. The same with your new training or credential. I hope that these 7 steps will give you a clear and concise plan towards being assertive when asking for additional money and training to advance your career.